Historical Background of the Book. Around 625 B.C. (roughly the same time period as Nahum's trip to Nineveh), King Josiah was ruling over the Southern Kingdom of Judah. Within about 13 years, the hostile Assyrian Empire would fall to the Babylonians. However, it would only be about 6 years after than before the Babylonians would begin invading Judah (around 606 B.C.). The Jews of the Southern Kingdom had seen how God had punished the idolatry and wickedness of the Northern Kingdom at the hands of the Assyrians. However, this had not persuaded them to give up their own idolatry and wicked practices. The Author and the Audience. During Josiah's reign, God chose Zephaniah to deliver a message to Judah. His name means "He whom Jehovah hides or shelters". Little is known about him. Some scholars think he may have been descended from King Hezekiah and been a cousin to King Josiah. While his message was primarily to Judah, there are passing references in the book to Assyria, Moab, and Ammon. Outline/Major Themes. As with many of the Minor Prophets, the message of Zephaniah included predicted judgments, exhortations to repent, and promised blessings. Ch.1 Judgment on the world in general and Judah in particular for their idolatry, violence, and deception. This would begin to occur within about 6 years and culminate in the destruction of Jerusalem and captivity of the people by the Babylonian king Nebuchadnezzar in 586 B.C. Ch.2 An exhortation to repent and persevere since the "day of wrath" was coming. 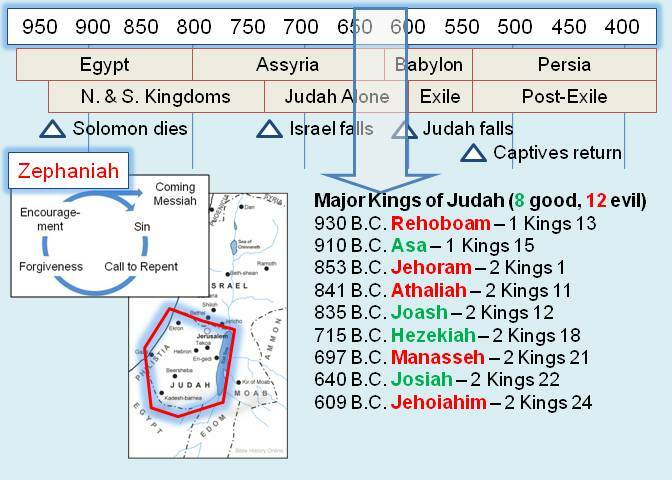 Although King Josiah would initiate a series of major religious reforms between 624 B.C. and 620 B.C. (2 Kings 22-23), this would be insufficient to avert the coming punishment at the hands of the Babylonians. Ch. 3 A promised conversion of the heathen and restoration of Israel. In the near-term, this would occur when the Jews were allowed to return to the land under Zerubbabel, Ezra, & Nehemiah beginning around 536 B.C. Some scholars also see a foreshadowing of the events in the Book of Acts with the establishment of Jesus' church (the Messiah's kingdom) with the gospel message being given to both Jew and Gentile. Being rich does not necessarily mean we have God's approval, nor will it spare us from God's disapproval when we sin (Ch. 1:18; Matt. 6:19-24; 1 Tim. 6:6-10; James 5:1-6). "The Day of the Lord" and a time of judgment will come (Ch. 1:7, 14-15). For the Jews of Zephaniah's time, that event was less than 50 years in the future. For the Jews of Jesus' time, that event was likewise less than 50 years in the future with the destruction of Jerusalem by the Roman army in 70 A.D. For us, we don't know when that event will ultimately occur when Jesus' returns in Final Judgment (Ch. 2:1-3; 2 Pet. 3:3-13).